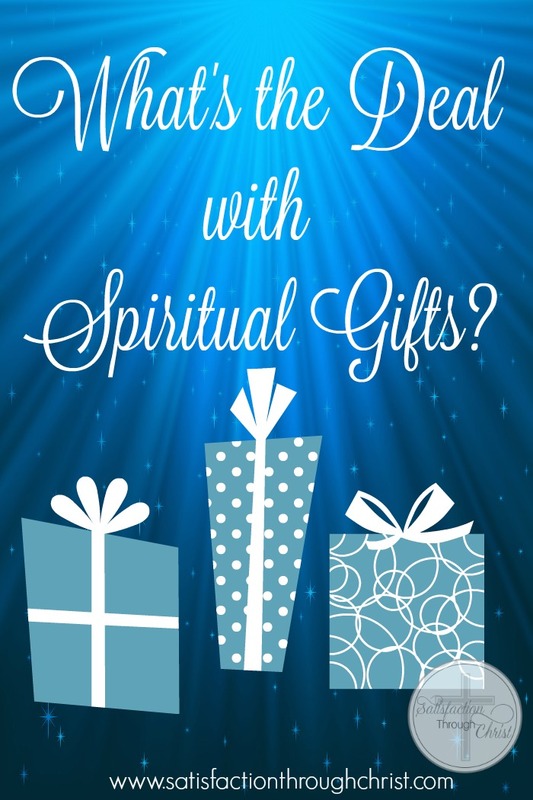 What’s the Deal with Spiritual Gifts? Charismatic churches and religions are growing, and evangelical churches are jumping in with spiritual gifts tests and classes, so many people are wondering, “What’s the deal with spiritual gifts?” Spiritual gifts as a whole are much too large to cover in one blog post. However, I decided to write a little about them because of a comment on my last post, Religion Matters, where I told about leaving a church that turned out to be charismatic, because we couldn’t overlook our differences. Specifically, I felt like I was in danger of being led astray by the heavy influence of the spiritual gifts. I would like to start by pointing out that in no way are the spiritual gifts unbiblical or negative in and of themselves. The Holy Spirit does give gifts to believers. At this point, I have heard some people say that God gives believers their gift(s) at salvation and they come out in the believer’s life in the form of the believer’s passions, talents, and abilities, which would assist them in doing ministry work. Other people seem to think that God gives believers gift(s) at certain times or situations where someone might benefit from them, in a supernatural way. Then there are the people in the middle, who don’t know, haven’t researched, or aren’t even aware of the sides of the issue. I fear that many Christians are here, not knowing what to believe or aren’t being taught to do the proper digging, due to a lack of discipleship. To be clear, neither side is debating the existence of spiritual gifts that accompanied the Holy Spirit’s coming at Pentacost in Acts, and that Paul gives plenty of instruction about in his Epistles. Likewise, in most cases, people on both sides also agree on God’s ability to do mysterious and surprising work as He wills. In other words, the cessationists don’t discount God’s sovereignty in the world, denying that something miraculous that doesn’t normally happen in modern times, could be a supernatural act of God. But it would be seen as the exception, not the norm. Unfortunately, there is debate. However, the proper reading and understanding of Scripture and some background on Church history goes a long way toward understanding it better. There are two excellent podcast episodes on EchoZoe.com that I recommend. Even though they are specifically discussing the gift of tongues, Ryan Habbena presents the issue of interpreting the Biblical use of the supernatural spiritual gifts. They are: Examining Tongues – Part 1 & Examining Tongues – Part 2. There is a movement called the New Apostolic Reformation (NAR). They think like this, including the belief that some of them are still Apostles and can attain a level of power even greater than the original Apostles in the Bible. Their “theology” goes even deeper and is completely twisted, and frankly, sickening. I wasn’t able to figure out if they were actually on the NAR bandwagon, but this is very dangerous ground, all seeming to start with the gifts. So, it can be a deception here, a deception there, and pretty soon it is a slippery slope downward. Since I came from a more liberal church before that experience, where they were open to spiritual gifts, (although no good hermeneutical Bible studies on the topic and no Church history or theological foundation was laid), made for a heart that was open to the charismatic church and could have gone further. Thankfully, I felt uneasy about many things there, turned to my Bible, did other research, and got out of there! It was God’s grace intervening and turning me back to Him. By this experience, I have learned so much, and now I truly know what I believe and have the solid theology to back it. So it’s not the gifts themselves that are bad or negative. It is our sinful, human use or misuse of them. Used properly, they build up the Church and other believers. It’s probably obvious that I came to be a cessationist – believing that the “power” or supernatural gifts are no longer in operation – at least not on a normal, regular basis. The Bible doesn’t say we are to claim the gifts or try to somehow invoke the gifts in any power of our own. Do I believe God can heal someone I pray for? Yes, if that’s His will. But I don’t believe someone actually has the gift of healing and can make it their norm. There are other non-power gifts, such as pastor, teacher, administration, etc., that I do believe the Holy Spirit empowers believers to operate in today. It’s just that the signs and wonders gifts were used by the Apostles and early Church as a sign of their conversions, and to build them up, before they had the full Word of God in the Bible as we do today. Even more so about this charismatic church was that the true Gospel message just wasn’t being proclaimed. When it becomes more about the gifts and getting what we want than about Jesus and His atonement for our sin and His glory, something is very wrong. Run away fast. Disciple of Jesus; student of the Bible; wife; mom of 3 "tween" girls; writer/blogger; consumer of coffee, dark chocolate & lobster rolls! Transplanted to Maine in 2015; homeschooling our 6th grader; and integrating into a new church. Bringing God glory through my story and shining the Truth in the world. Thank you for responding so thoroughly and thoughtfully to my question! I appreciate hearing your point of view, and the amount of time, effort, and research you put into this post! You’re welcome, Ariana. Glad I was able to clarify. Many blessings to you.